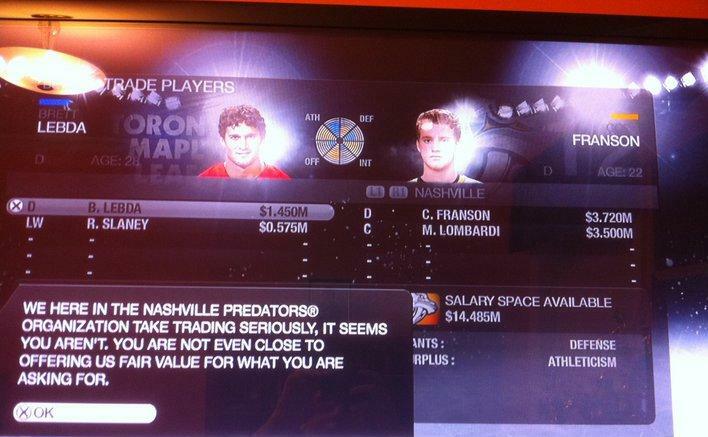 NHL 11 knows the truth. ﻿On Sunday afternoon, the Maple Leafs robbed the Nashville Predators at gun point and stole 23 year old defenceman, Cody Franson. They also tossed Matthew Lombardi into their sack in hopes he recovers from a concussion and becomes a gem. The Leafs sent 7th D-man (and one of the worst NHL defenceman I have ever watched in person), Brett Lebda and Robert Slaney to Nashville for Franson and Lombardi. When I first was told of the deal I thought it was some rumour on Hockeybuzz that was made up by Eklund. Until I read it myself I thought there was no way Nashville would do that deal. But when you look at it from a financial stand point, it was a robbery as the Leafs took millions of dollars from the the cash strapped Nashville Predators who had to make this deal. Matthew Lombardi signed a 3 year deal with Nashville last season, but was injured 2 games into the season and sat out the rest of the season with a severe concussion. He still hasn't been cleared to resume summer workouts and it's unclear when he will play again, if at all. The problem for Nashville was that Lombardi had a contract that wasn't insured so no matter what they had to pay the remaining $7M on the contract. Lombardi makes $3.5M a season for the remaining 2 years on his contract so the deep pocketed Maple Leafs came along willing to take a chance on Lombardi, but wanted something young and worthwhile tossed in. So what it comes down to is that for Nashville to save some cash they were forced to toss in Franson. 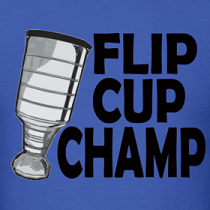 It's a great move by the Maple Leafs management. Even if Lombardi doesn't play a single game for the Maple Leafs they come out with Cody Franson who has the offensive upside to be a great player. Worth the risk considering they only gave up a 7th D-man and a 22 year old that is an average player at best in the ECHL - which is 2 leagues below the NHL. The trade has left hundreds of thousands of people cheering in the streets of Toronto at the departure of Brett #LikeALebda and the realization of a promising D-core. Love the NHL 11 images. Franson will be solid but I hear that he is very soft and brutal in his own end. 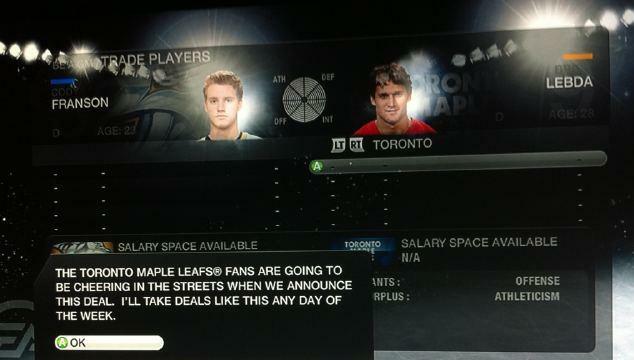 Haha I like the NHL 11 images. It doesn't lie!